To what extent should spiritual information be part of a patient’s medical assessment? How should physicians respond when patients refuse life-saving care on religious grounds? Should doctors pray with their patients? Questions such as these raise deeper ones about the goals of medicine and the nature of healing. 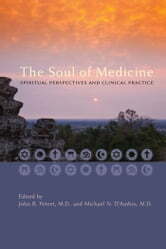 In a set of engaging and candid essays, The Soul of Medicine explores the role and influence of spirituality in clinical practice, professionalism, and medical education. The contributors to this volume approach this topic from their own spiritual perspectives—Jewish, Christian, Muslim, Buddhist, Hindu, New Age / Eclectic, secular, Jehovah’s Witnesses, and Christian Scientist. Their thought-provoking essays provide rich insights not only into the needs of patients with various world views but also into how spirituality influences the practice of medicine. When their own spiritual issues arise in medical practice, physicians rely on their professionalism, ethics, and education. To better understand how various world views are incorporated into clinical work, doctors must ask themselves—as these contributors have—a series of important questions: What insights about life and healing does your faith provide? How does your faith challenge or reinforce contemporary medicine? How do you assess and address spirituality in clinical practice? How do your own beliefs influence your interactions with patients? The Soul of Medicine encourages medical students and practitioners to recognize the spiritual dimensions of medicine, to consider how these dimensions inform their own education and practice, and to be compassionate about their patients’—and their own—religious beliefs.